Another recent purchase that arrived on my doorstep last week was this adorable ruffle, cold shoulder top! I got it thanks to seeing it on Rachelle. 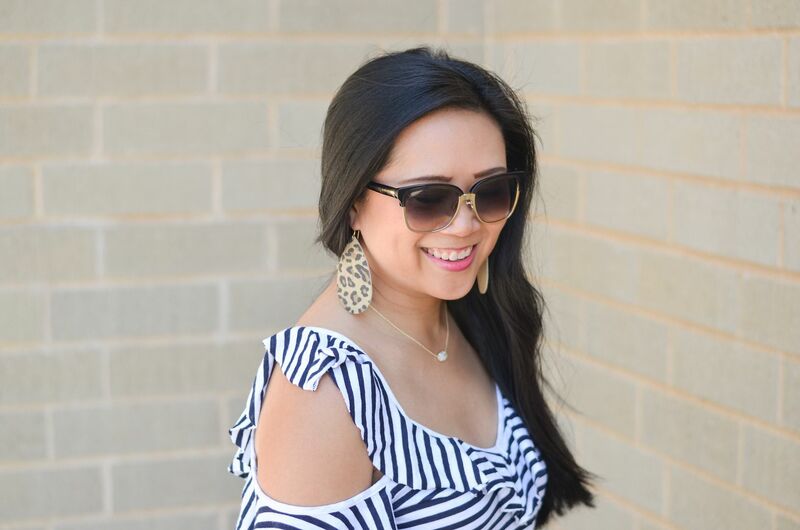 You know I love stripes and cold shoulders, so it was just meant to be mine. Let's be real. I didn't bother even trying to fight it! It's super easy to throw this top on with destroyed denim, but since it was thicker than pea soup this weekend, I decided to be one part nautical and two parts patriotic by styling it with my white denim shorts instead. July 4th is around the corner, and I always tend to crave this color combination even more when we approach that time of year. I was so tempted to go super matchy matchy with my favorite red, white, and blue bag, but cognac is always a nice option with red, white, and blue! Cognac basically rocks with all colors in my opinion! It looks like these leopard earrings are currently sold out on their website, and I can totally see why! I always love pairing leopard with navy. I also love print mixing with leopard and stripes! Therefore, it seemed like a logical choice to take these earrings out for their maiden voyage with this outfit. For July 4th this year, we will be in Orange County for the week! The husband's parents rented a huge beach house for all of us, so it will be the two of us, his parents, both his sisters, and then one of his sisters is married with two kids. It will be a full house! His brother and his brother's GF live in SoCal, so we will be getting a lot of face time with them as well! And my sister and I are throwing my dad a 70th birthday party the weekend after July 4th, so I'm glad the timing worked out and I could kill two birds with one stone with this trip! I can't believe it's just in 3 short weeks! Crazy! I am off to Boulder tonight, so be sure to follow along on Snapchat (carylee07) or Instagram if you want to see what it's like to be submerged in such a heavy Pilates community! I cannot wait! Your 4th of july weekend sounds so fun and I love how you style this top with white shorts. So So cute. That top is soooo cute! Love your fun, patriotic styling. I also love that particular shade of cognac...it's a little softer and more neutral than some options. I'm sure it goes with everything. And man, you are going to be BUSY for the next few weeks!! Love, love, love this outfit! That top is so tempting. I think I'd wear it a ton so you might see it on me at some point too! And your Summer sounds like fun! Love love love this top on you!